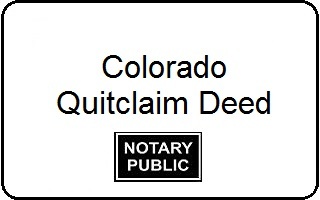 A Colorado Quitclaim Deed (quit claim deed) is a type of deed used to transfer ownership or to quit or end someone’s claims of real estate ownership. The grantor is the party transferring their present interest in the property, if any. The grantee is the party receiving the interest. A quitclaim deed, or non-warranty deed, should be used with caution. It does not include any warranty of any present ownership or that clear title is being transferred. The grantor may not be a current owner or the ownership may be clouded or disputed. It is often used to clear up a technical defect or cloud in the chain of title or to release lien claims against the property, such as a deed of correction or a deed of release. A quitclaim deed is often used in transfers between family members, to add or remove someone from title, to add or remove property from a living trust, or to change ownership from joint tenants to tenants in common, when a warranty deed is not needed. (c) That he warrants to the grantee and his heirs and assigns the quiet and peaceable possession of such property and will defend the title thereto against all persons who may lawfully claim the same. A quitclaim deed does not include warranty wording, covenants or title protection. A longer warranty clause might state free and clear from all former and other grants, bargains, sales, liens, taxes, assessments, encumbrances and restrictions of any kind or nature whatsoever. A special warranty deed is used less frequently and only warrants title during the time that the current owner has owned the property, not before then. It is often used when property is acquired by the seller after a foreclosure. If buying property with a quitclaim deed or special warranty deed, it is prudent to first do a title search as due diligence to check for any title problems. The buyer may have little recourse if problems are found after the sale. See a free sample form of a Colorado Quitclaim Deed. For educational use. Use at your own risk. Once the blank spaces in the deed are filled out legibly, all grantors listed must sign the deed in front of a notary. The grantee(s) does not need to sign the deed. After the deed is notarized, it must be officially recorded in the county clerk and recorder’s office for the county where the property is located. Be sure to comply with the document recording requirements. The mailing address of the grantee must be included. CRS 30-10-406(3)(a) requires that all documents have a top margin of at least one inch and a left, right and bottom margin of at least ½ inch. You must pay a county recording fee and a state documentary fee of 1 cent per $100 for transactions when the consideration is $500 or more. After the deed is recorded, the county will send it to the party listed at the top of the deed within a few weeks. Make a copy of the notarized deed before giving it to the county. The current recording fee schedule for El Paso County, Colorado is $10.00 for the first page, $5.00 for each additional page. A page is one side of up to and including an 8 1/2″ x 14″ sheet. Plus a $3.00 surcharge per document. Contact an attorney for legal advice regarding a quitclaim deed or warranty deed.